The National Football League, which is now apparently a year-round microcosm of the social ills plaguing this country, stayed in the news last week when it adopted a new National Anthem policy, stating that it will require players on the sidelines to stand during the anthem, while allowing players who wish not to participate to remain in the locker room during the song. 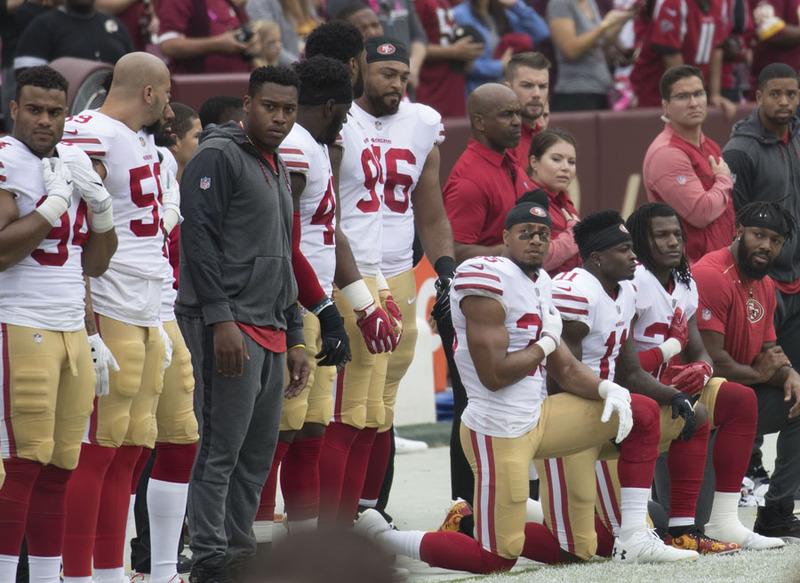 NFL brass announced it would fine any team with a player that decides to kneel during the anthem and that player could be subjected to disciplinary measures by their team. NFL commissioner Roger Goodell said in part that this will ensure the moment is treated with respect, while one of the owners who voted for the new measures said the decision puts the focus back on the games. Strange comments coming from a league that routinely puts its sport second to all manner of advertisements during gameplay, while also using patriotism to sell everything from cars to beer to sausage. The only cause the NFL has ever remotely cared about is the cause of making money. Goodell and his gaggle of billionaire owners love to play pretend patriotism—draping themselves in the American flag while fighter pilots fly overhead and that latest pop star belts out a four-minute version of the anthem. If you think they are putting on that show for love of country, you are flat wrong. The red, white and blue spectacle is nothing but fuel for the NFL’s marking and merchandising empire—an easy play for advertising dollars. And as this is a capitalist society, there is nothing ostensibly wrong with that endeavor. In fact, viewers eat gladly buy into it and everything else the tax-exempt league spews forth. It might be an unpopular opinion, but the only true solution to this is to ban the National Anthem from all sporting events. Why is it even there to begin with? That moment to honor America belongs in appropriate realms, not bookended with ads for Bud Light and Johnsonville Bratwurst. Though sports are important to this country, they are largely inconsequential to the grand scheme of things. The National Anthem deserves better.